Visualize this: a client comes to you with the request to gamify an Annual Management Meeting of a large Chinese multinational. Have we not heard over and over again that Gamification is not for older people and not for the board room? Can this even be done? Oh yes it can! See below. Our client is Director of Marketing for Vinda Ltd. Vinda makes tissue paper on a big scale. You may know them from Tempo tissues, Libero diapers or Libresse hygienic pads. They are a big company, with a big history. The Director attended a workshop with Yu-kai Chou and got excited about Octalysis. She really wanted to implement Octalysis in her company but needed help to make sure the top management also felt the same. So why not start with gamifiying the Annual Management Meeting (AMM) with our help? AMMs (or AGMs) are normally not very exciting and are often used to tick off decisions that have already been taken in the run up to the meeting. Most attendants are mostly interested in getting the budget items approved for their own business channel. So Supply Chain will only pay attention during Supply Chain and Marketing only during Marketing agenda items. 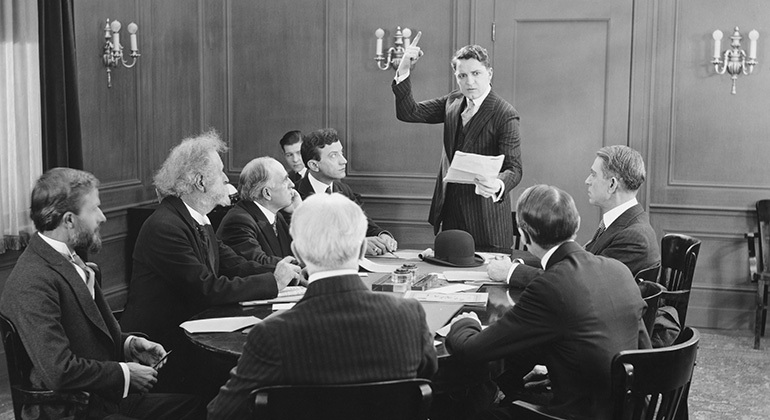 Often the meetings end up as boring affairs with little interaction or synergetic outcomes. Was it possible to get people really interested in the AMM and get participants to share and become creative across business channels? That’s where The Octalysis Group came in. Regular readers of this space know that an experience mostly consists of 4 phases: Discovery, Onboarding, Scaffolding and End Game. For short duration meetings like the AMM (which lasted 3 days), the End Game is less pronounced so we will focus more on the first 3 phases. Because of the age and IT exposure of the target group, we decided to keep the IT components to a minimum. However, since all of them own a smartphone, we knew that an app would not by definition be a bridge too far. Annual meetings are often prepared well in advance. Participants know what is coming so there is little Curiosity push (Core Drive 7: Unpredictability and Curiosity) to take action. So this year we kept the meeting place and program completely secret. Then suddenly participants were sent secret codes with which they could unlock the location and agenda. For this they needed to download and app (the experience vehicle) to fill the code in. So we used CD7 to empower a desired action: download and open the app. After unlocking the app, the users got send messages by email that they were expected to leave questions/issues they wanted to have discussed. It was made clear that the Chairwoman of the company was already in the app and the she had already left some issues to be debated. This led to a big Fear Of Missing Out reaction (Core Drive 8: Loss and Avoidance), and all participants listed many ideas that they wanted to discuss. We used black hat design to motivate people to take action. We grouped the Vinda execs into groups with colleagues from various business channels. Their first assignment would be to cook dinner the night before the AMM in a cooking club. For many managers this was the first chance they had to actually cooperate with their colleagues. At this stage they were still new in the experience so the Social Interaction needs to be non-confrontational and light-hearted. Hence the cooking setting. The next day the AMM was opened and the group objectives were laid out. We used a game mechanic called Message in a Bottle from the SelfDRVN app to facilitate the process. In the mechanic you see bottles floating in the sea and when you tap on one you can see the message inside and you can leave a vote. The goal was for groups to try to post and reply to as many questions and ideas as they could. However, per group of 3 they only had 3 posts per session so they really had to discuss and strategize which topics to posts and which topics to answer. Scaffolding: how did the executives level up? The strategizing design was very motivational (Core Drive 3: Empowerment of Creativity and Feedback) and led to a lot of cross business unit communication about each others business channels interests. The posts submitted were all anonymous, and only the most upvoted ideas were published on a big board with the name of the submitter. This way we overcame the fear of people posting a ‘bad’ idea (we create anti Core Drive 8) while at the same time rewarding (in public) great ideas. The group with the most ideas upvoted would level up fastest (there were 4 levels). At the end of the meeting groups got handed out an amount of darts depending on the level they achieved. For Level 4 you got 6, while for Level 1 you got only 1. The winner of the AMM is the group that scores the highest total score after throwing all their darts on a dart board. In theory, even Level 2 could still win if they would throw very well. Deciding who could throw the darts in the group created even more social interaction, as did the dart throwing game itself. The result: was our Octalysis design successful? Love love the idea! I wish more executives would want to go bit more/far than everage.